A Facebook memory popped up today. This is not unusual, of course, but they typically involve pictures of Jacob. They always make my heart swell, as he continues to grow so much each day. Today’s reminder was different though and it made me pause. 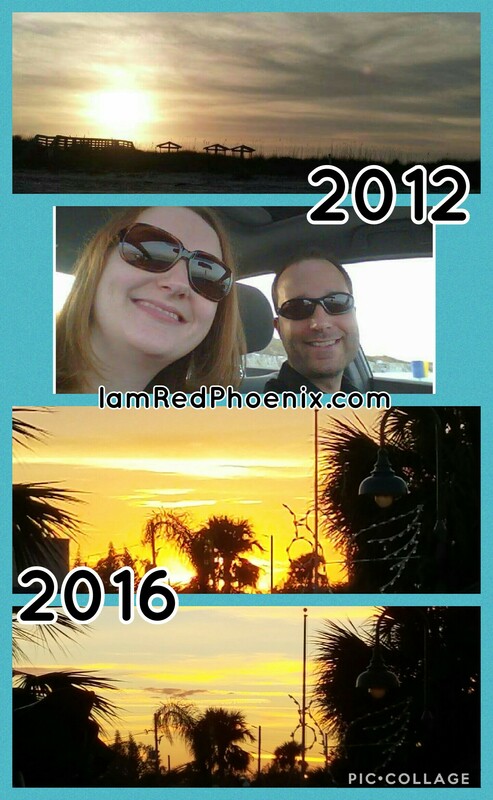 In 2012, Joe & I spent New Year’s Eve at the beach. We enjoyed dinner, a glass of wine and a walk down the beach at sunset. I have always been anxious to be off the roads early on a night like tonight. The picture was of us, smiling broadly, the beach behind us. The very last sunset of 2012 going down in front of our eyes. This year, we unintentionally did the same thing. Jacob woke up with a bit of a cold so we changed our plans. We ventured to the beach, enjoyed appetizers at the same restaurant and visited the beach. The sunset in front of us, closing down on 2016. The amount of things that have changed in 4 short – or long – years is astounding. The restaurant itself went through a massive renovation and was closed for months last year. It was more of a hole-in-the-wall then than now but still just as good. The ocean has remained constant, with its waves crashing loudly, though I can just imagine what has changed beneath the surface. The sunset is equally as gorgeous and glowed brightly against the blue sky as the sun lowered itself down. Then there is us. My mom joined us this year, which is the first time in over a decade that I’ve spent this night with her. I’ve gained and lost a few pounds over the years and the lines on my face have deepened with age, stress and tears – of laughter and sadness. I’ve been through many hairstyles – straight, long and bald. We didn’t have the blessing of Jacob back then and little did we know, a year later I’d be proudly holding my belly as we watched the ball drop…struggling to stay awake. I started a new job since then. Though the same company that I’ve been with, it has been both rewarding and challenging as I learn new things. We bought a new-used car and our parents (my inlaws) bought a boat to keep us all busy and enjoy the water. We have traveled to the Caribbean to celebrate my big sisters 30th birthday, visited Georgia countless times to visit my baby sister and her husband, had multiple trips to my hometown for visits with the people we love and trips around Florida to visit friends and local parks. Life is relatively the same in terms of where we live and yet it is so very different. It’s hard to imagine life before cancer and even harder to remember life before Jacob. Our routines are so different than they were back then and our priorities are very, uniquely different. We have made more new friends than we can count and though we lost touch with a few, we all found our way back to each other over the last year. I have rediscovered my faith in God. Though I never lost in entirely, it has strengthened exponentially and I remain steadfast in my faith and love for our Lord. Though the sunset is similar, the years between are memorable for so many reasons. Our blessings are unique and huge. We are loved by so many and love hard in return. As this year comes to a close, remember all the moments – big & small – that you are so incredibly blessed with. This year comes to a brilliant end while 2017 lingers, waiting anxiously in the distance. Happy New Year, everyone. I hope this year is filled with love, laughter and overwhelmingly wonderful memories. Keep spreading the love, my friends. Now & always. As I reflect on this last year, I realize many people are over it, meaning they are ready for the bright new year that 2017 will bring. They are ready for positive change, new beginnings and a fresh perspective. While I am also ready for 2017, I am not closing the chapter on 2016 in sadness or anger. This past year has brought a lot. I had a double mastectomy with 21 (21!!!) lymph nodes removed, I had expanders put in place of the breasts that once fed my son, I experienced radiation- twice, I had brain surgery, herceptin every three weeks from January until July, two new chemo pills that equate to about 686 pills yet well over $25k, 4 injections totaling over $28k, I had a few colds but many stomach aches, Jacob had pneumonia once and a cold twice and Joe had a sinus infection. We have traveled to 6 separate cancer centers across the east coast and Texas, met with countless nurses and doctors throughout the year, and the list goes on…I am sure this is just the beginning of what this year has brought in terms of medication, treatment and, well, cancer. Yet I can’t help but think about what else 2016 gave me. I made a few dozen Love Jars trying to brighten someone’s day, worked fulltime between my surgery and radiation, bought a new-used vehicle (for the first time in 8 years) to celebrate being “cancer free”, made sure each cancer visit was filled with some sort of adventure, I’ve had 2 paint parties that were filled with endless laughter, was blessed by Team Gina – who not only gifted my family my medical deductible and a weekend away but also new friendships that I didn’t know I NEEDED in my life, a fundraiser in New York to help pay the insane cancer costs, more new and priceless friendships that formed by a simple hello, an unexpected (free!) weekend cruise getaway that my husband and I needed more than we realized, a first ever sisters weekend, a trip to Savannah to meet my baby sister, my baby sister’s WEDDING – and a wonderful visit with family and friends, wonderful inlaws, my best friends wedding!, a few hundred blog posts, probably a million pictures and enough belly laughs for me to have a 6 pack (not happening). This year also brought dozens of new words for Jacob, a hundred or so walks, a new bedtime routine that includes my bed, a new food change for me, countless sunsets mixed with a few late nights where little man was up until it was “too dark”, snuggles that are worth their weight in gold, 2 clothes sizes changed for Jacob and he went through a lot of shoes as his tootsies grew. He had his first haircut and another one recently, he met Mickey, Minnie, Pluto & Goofy, he picked out pumpkins and his very own Christmas tree, we have said a lot of prayers, talked to the stars while pointing out the moon, went on boat trips around the intracoastal, fished a whole lot, visited my happy place (never enough! ), and giggled…oh, how we giggled. We have read hundreds of books and visited the book fair, learned to count to 17 (and 10 in Spanish! 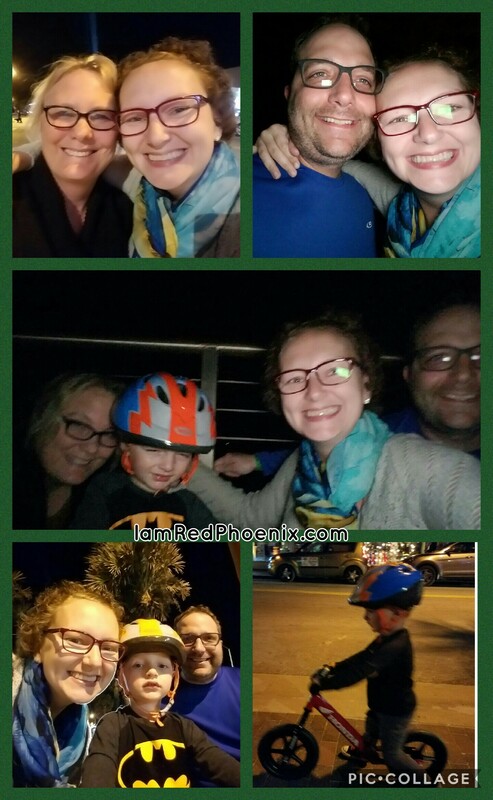 ), we have sung the alphabet song more times than I can count, done tons of arts & crafts, rode his strider bike, he is no longer afraid of his four wheeler, looked forward to his advent calendar all month and celebrated each holiday. I haven’t read nearly enough books but discovered a love of audio books to take over the trip to work. I didn’t write nearly as much as I wanted but took a leap of faith and attended a writing seminar – and learned so much. I imagine that this just barely scratches the service of what this year has brought. I began the year by celebrating my cancer free future but quickly learned that the cancer has taken up permanent residence. The emotional toll of that sentence is hard to process and yet I refuse to let it take over. This year has brought a lot of BIG events and change but it’s the little moments, the day to day life, that I focus on most. Our daily routine and snuggles sessions are what I look forward to most. There are no words to describe the gratitude that I have for each & every day. I am glad to do the mundane things that I once hated – laundry, dishes, etc. These things mean that I feel well enough to do the day-to-day tasks. I don’t know what 2017 will bring but I hope it brings stability, wellness and inspiration. I hope it is filled with belly laughs, endless snuggles and priceless memories. I plan to travel as much as I can and see parts of this world that have only filled my dreams. I intend to make memories with my family and friends. I want to experience new things and embrace the moments that make life so wonderful. What has 2016 brought you? What plans do you have for 2017 to be new and different? I’ll be posting about my fun filled weekend at the #SCBWIFL2016 workshop on Instagram so hop on over and check it out!! On my last day of work before surgery, one of my office mates handed me a cross. Her husband hand made it and thought I would like it. This brought tears to my eyes for many reasons. One of those reasons is my recent visits to church. Another reason is that I do not own a cross. Our house was robbed a few years ago and most of my jewelry was taken. I had yet to replace my cross. This kind, thoughtful gift meant a lot for a lot of reasons. I mentioned the other day that my anxiety is kicking in with my upcoming surgery. I was feeling really good about it until about a week and a half ago, when the pain in my lymph nodes and tumor started to intensify. There has been pain on and off for months, mostly around chemo days. The oncologist has assured me that, while it doesn’t always happen, it typically means the tumor is dieing. Despite knowing this, the recent pain has unnerved me. I can feel it in my arm when I reach for something or pick up Jacob. It has created a fear in me, a fear that I have fought hard to keep at bay throughout this journey. What if the cancer is fighting harder than me? What if, despite all I have been through since August, it is spreading? What if I am losing this battle? I have been hesitant to share this fear because I don’t want it to be true. I am hoping and praying that when my surgeon opens me up, she will find nothing but dead tissue and dead cells. I have been praying hard for this, yet the fear has remained. At church today, there was a lot of discussion about revelation and the coming of days. It wasn’t quite the sermon I was hoping to hear, but God likes to throw a curveball sometimes. At the end of the sermon, the pastor mentioned that we need to pass our sins, our worries and our fears up to the Lord. Have I heard this dozens of times before? Yes. Is this new information? No. Is it what I needed to hear today? Absolutely. So, today, I am letting go of this fear. There is, quite literally, nothing more that I can do prior to surgery. I am letting go of my fear and my anxiety and handing it off. I feel better already. Oh, and I am once again reminded that I truly am too blessed to complain. Happy Sunday, folks. May your day be filled with sunshine and happiness, just like mine. Today marks the beginning of Breast Cancer Awareness month. I’ve been thinking about this month for weeks now. I want to do something to give back but I couldn’t decide what I have the ability to do. This morning, I woke up and dressed for work. While my husband and I were getting ready to walk out of the house, I realized it was October 1st. I also realized that I wasn’t wearing anything pink. I went back to change my clothes and decided that I would commit to wearing pink every day this month. It is the least that I can do, especially since I have not been able to come up with a way to give back. At least I can show my commitment to awareness through wearing pink. On the way to work, I commented to my husband that I had posted 41 times on my blog. He responded that 41 blog posts means 41 pages in a book. I smiled at that! Changing my clothes made us a few minutes late leaving the house – oops. My husband had an 8am meeting so I dropped him off and brought little man to daycare. After dropping little man off, I started thinking again about what I can do. I recalled my husband’s comment and thought to myself, Maybe one day I’ll be able to hand out my book to people undergoing cancer treatments! This made me smile again. I asked myself what my abilities are, thinking that I can utilize them in some way. Ok, I can write. How can I utilize that to help people? And then it hit me. 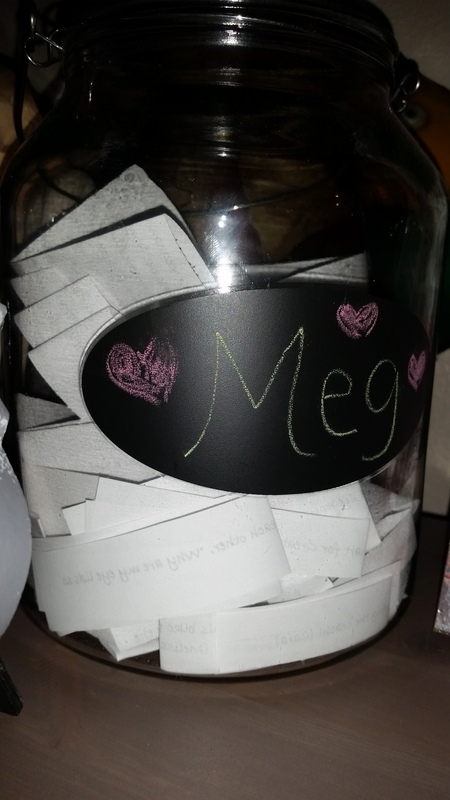 I wrote about The Love Jar that was created for me a few weeks back. This is the second one that I have received and I absolutely and completely LOVE IT. When I am having a bad day, I pull out a one or two (or five) of the strips of paper in there. They make me laugh or smile or cry or all of these at once. They make me feel so good inside. It helps alleviate the stresses of treatment and it reminds me of how loved I am. It gives me strength. I want to create Love Jars for people undergoing treatment for cancer. I want to fill them with inspiration, positive thoughts and words of wisdom, strength and courage. All of the things that can help someone through the challenging treatment days. I want to bring them to my treatment center and leave them to be shared with the people who receive care there. While this is a small gesture, it is something that can help make people smile and feel good, during a time they need it most. All of you make up the Red Phoenix community, which will be the heart and soul of these Love Jars. If you want to help by sharing your thoughts, kind words and encouragement, please please please do so! 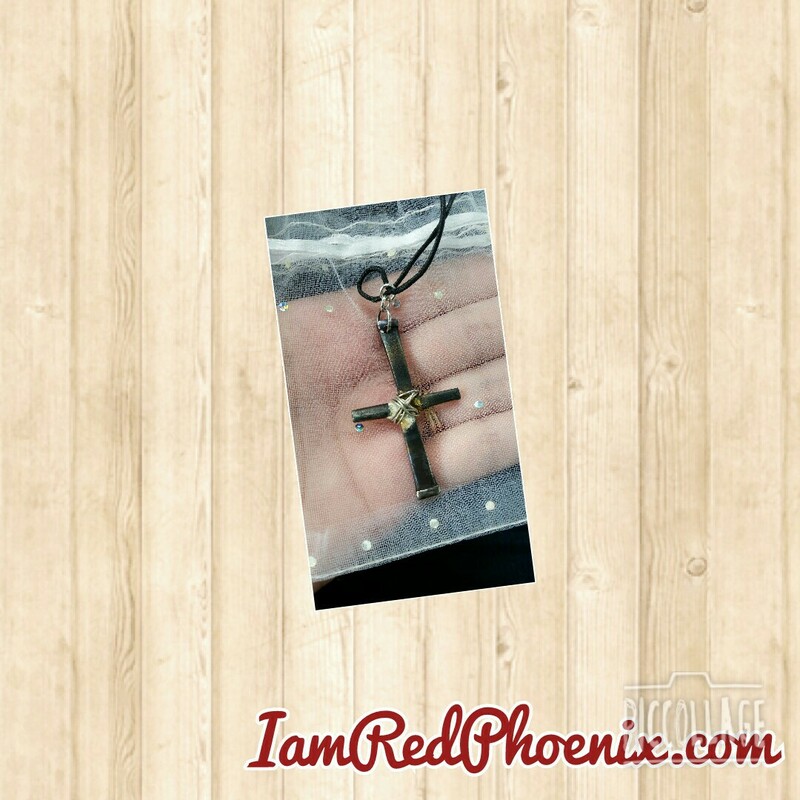 Leave a comment here, on the I am Red Phoenix Facebook page or send me an email at Red@IamRedPhoenix.com and I will gladly include it! Here’s to giving back – and helping to make people smile!